We went to the Cubs-Angels game last night at Wrigley Field. While the game was a lot of fun, and Alfonso Soriano is happy and amazing, the real gem of the night was the SportsWorld shop across the street from the stadium. We headed straight to the clearance section because we had no interest in buying a $200 Darwin Barney jersey or any other legit Cubs apparel. What we found was better than anything we could have possibly expected/hoped for. What follows is a countdown of the 25 most incredible jersey/shirseys we found. 25. 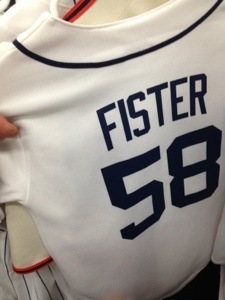 Doug/Dog Fister: No Verlander jersey in sight, just this poor replica jersey of the Dog Fister himself. 24. Steve Lombardozzi: Everybody loves scrappy switch-hitting utility players. 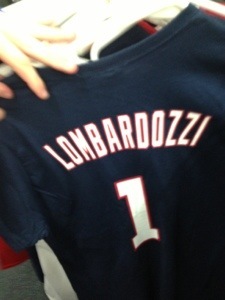 Get yourself a Lombo jersey.